Place pork tenderloin into slow cooker, and cover with yellow onion, habanero, garlic, and dried apricots. Sprinkle salt and pepper evenly over dish. Pour salsa over pork and ingredients, followed by your broth. On low heat, cook the tenderloin for 6-8 hours. Internal temperature of the tenderloin should reach at least 145 °F. Serve with a wedge of lime and your choice of side! I recommend cilantro quinoa, or whole grain corn tortillas. This is also delicious atop spaghetti squash for those on a grain-free diet. Hollow out your sugar pumpkin as if making a jack-o-lantern. Set seeds and top aside for later use. Pumpkin seeds may be rinsed and kept for roasting if desired. Use a sharp-tipped knife or fork to make multiple, shallow cuts into the squash’s flesh from the inside. Dust the insides of the pumpkin with salt and pepper. Bring 1 cup of dry quinoa to a boil in 1 1/2 cups of broth–add salt and pepper as needed, depending on contents of broth. Let simmer for 10 minutes, or until no more broth remains. Quinoa should be just slightly undercooked. Set aside. Finely chop yellow onion and green bell pepper. Add olive oil to medium sized pan and bring to low heat. Add garlic, red pepper flakes, cumin, 1/2 to 1 tsp sea salt, and a pinch of black pepper. Let sit for 2-3 minutes. Add onion and bell pepper, saute on medium heat. Once tender, add 1/2 pound of ground bison and cook until fully browned. Set aside. Saute any additional vegetables (I recommend mushrooms, carrots or red onion). Sun dried tomatoes are another good addition. Saute on medium heat with olive oil, salt and other spices to taste. Set aside. 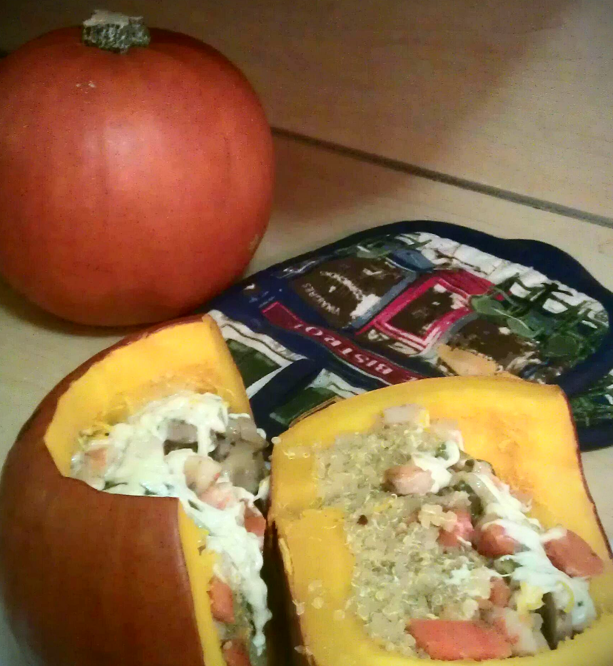 Fill pumpkin approximately 1/2 way with the pre-cooked quinoa–pack it down gently with your spoon. Sprinkle 1/3 cup of cheese on top. Add your seasoned bison next, until the pumpkin is approximately 3/4 full. Add another 1/3 cup of cheese. Add any additional sauteed vegetables. Gently poor 1-2 tablespoons of remaining broth over contents of pumpkin. Sprinkle in the remaining cheese and replace the top of the pumpkin. Set stuffed pumpkin into baking dish and bake at 350 degrees for 90 minutes. Slice, cut, dig in & enjoy!